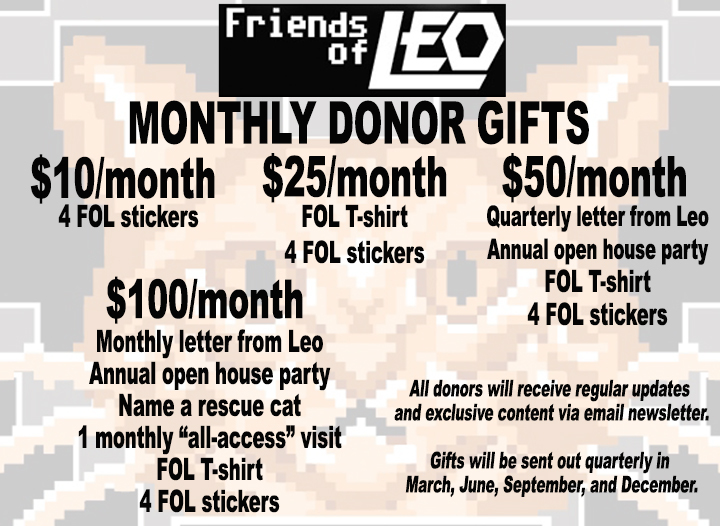 Friends of Leo is our monthly donor program. Consider donating on a monthly basis to help the cats in our care regularly. These donations will help cover the medical costs like vaccines, spay/neuter surgeries, and medication for illnesses. As we continue to take in more cats this funding will go towards providing the cleanest and healthiest environment for Catcade kitties. Who is Leo and why do I want to be his friend? Leo is The Catcade resident cat. He's a stunning, 15 pound hunk of orange fur and golden eyes. Who wouldn't want to be his friend? Leo came in on the very first transport done at the 'cade before our doors were even open to the public. He had previously been returned to another shelter because he was acting out. After meeting him and spending a couple days with him we could tell that he needed lots of attention. As soon as we opened to the public we noticed that he settled in, instantly became an integral part of the socialization process for incoming cats, and spent his time jumping from lap to lap in the lounge. Leo has become more than a simple mascot. He is just as much a part of the Catcade and is a constant reminder of the work we do, the lives we impact, and a member of our family since day one. He reminds us everyday that we work for him and we do all of this to save cats just like him. Quarterly gifts will be sent in March, June, September, and December. *Must be donor for two months before gifts are sent out.. The Catcade, Inc. is a 501(c)(3) non-profit organization. Tax ID: 81-5469117 All donations are tax-deductible to the full extent of the law. No goods or services will be provided in exchange for the contribution.